Amazonian tribes are uniting against the Brazilian government’s plans to build hydroelectric dams right on their doorstep. As the projects accelerate, people have not been consulted, nor have proper environmental studies been carried out. The Munduruku, Apiaka, Kayabi and Rikbaktsa tribes have their home in the world’s biggest forest, stretching across nine nations and harboring numerous unique flora and fauna not witnessed anywhere else. But its future is questionable, given the constant expansion of ‘civilization’, bringing about irreversible damage in the form of deforestation, wildlife and habitat loss and other untold consequences that follow. All of this directly affects the indigenous people. On Thursday they released a joint statement amid the Brazilian government’s increased efforts to exploit hydropower. 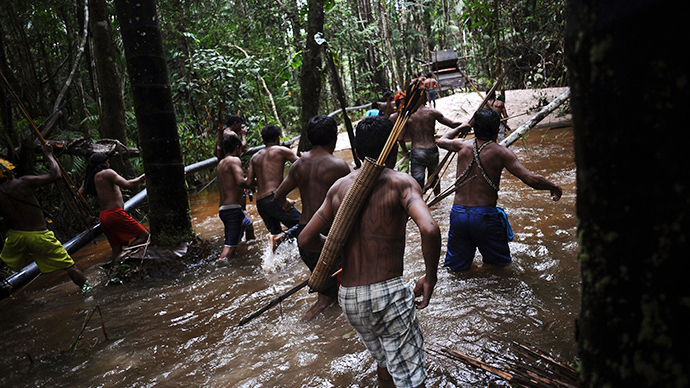 The tribes demanded an immediate halt to the construction of four dams on the river Teles Pires. If their demands are not met, they say they’re prepared to take matters further, because they know if they let this slide, bigger projects will follow, as the government is intent on gobbling up whatever resources it can, and is doing so at an increasing rate. In one alarming example, an upcoming project on the Tapajos River that runs through the Amazon threatens to completely flood one tribal territory. The upcoming Sao Manoel dam, the tribesmen say, will wreak havoc on water quality and fish stocks. They claim they haven’t been consulted – which goes against both national law and international practices. They further claim that adequate environmental studies or risk assessments have not been carried out. “The government builds dams using hasty and incomplete studies, without seeking to understand the consequences of the destruction of nature for our lives. It authorizes the operation of dams without taking into account how the indigenous people will live without fishing, water and hunting,” their statement read. Valdenir Munduruku, one of the leaders of the tribal alliance, told the Guardian that tribes would have no choice but to escalate matters. “If the demands aren’t met, I’ll have to occupy the construction site. They can’t do what they are doing without listening to us,” he told the newspaper. Local reports indicate some parts of the construction site have all but reached one village. Brazil’s motivations for an increased expansion into the Amazon lie in low-carbon energy. The government believes it cannot sustain present growth and meet green energy goals unless industry gets a move on. With 250 upcoming projects, the situation looks dire. Numerous international appeals are in existence today; the WWF is among the many names urging governments to exhibit a greater concern for the Amazon. However, big money always seems to win – even when some lower courts initially rule in support of tribal claims. Such a coming together of the four tribes could be seen as highly unlikely – left to their own devices, they were locked in a bloody feud with each other. This changed in the 19th century, when colonialism bonded them against a more urgent enemy. The situation appears not to have changed much.